In the Petrochemical Industry crude oil and natural gas, extracted from the ground or from below the sea, are separated and processed into different products that represent the base or are additives to a large variety of end products such as plastics, paints, detergents, healthcare products, pesticides, rubber, tires etc. One category of the petro chemical industry is defined as refineries. Refineries separate the crude oil and natural gases into lighter fractions by a distillation processes (or refining). The lighter fractions then undergo different process in different petrochemical industries. 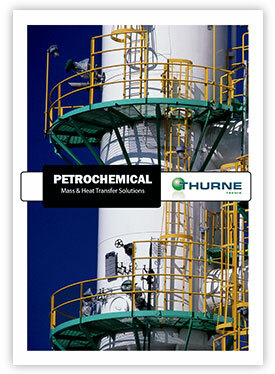 The challenges in the petrochemical industry include heavy fouling medias, high security demands and tough chemical and mechanical environments such as corrosion, high pressures, high temperatures etc. As the consequence the industry requires robust process solutions with European standards in quality and regulatory aspects to as low costs as possible. Thurne Teknik cooperates with leading manufacturers worldwide, represented in US, Europe and China. The product scope contains pressure vessels, distillation columns, reactors, heat recovery units, condensers and re-boilers, column internals, piping and ruptures discs, available in high grade materials.